Have you always wanted to learn a new skill but haven’t made the time for it? Why not try surfing lessons in Fort Lauderdale during your beach vacation? While staying at one of our luxurious, relaxing vacation homes, you can try surfing lessons at a local beach! The thrill of standing up as the waves rush by you will be well worth the lessons. Then, you’ll get to test out your new talent during the rest of your vacation! For more ideas on outdoor activities and water sports to enjoy during your summer stay, download our free Vacation Guide. Surfing lessons in Fort Lauderdale are just one of many new things you can learn during your vacation! The most popular place for surfing lessons in Fort Lauderdale is the EZride Surf School. Providing professional Fort Lauderdale surfing lessons, EZride operates on many beaches in South and Central Florida. Open seven days a week and offering schooling for all ages and skill levels, the outfitter is ideal for vacationers looking to take up a new talent. If you already know how to surf but want to improve your technique, this is also a great option for you. Cut backs, aerials, or simply flowing with the waves are a few skills you can pick up during a lesson. We recommend starting off your vacation with a surf lesson so you can use your new skills throughout your entire stay! Another great outfitter for surfing lessons in Fort Lauderdale is Hang Loose. Founded by a surfer with over 25 years of experience, Hang Loose offers lessons and summer camp to teach all ages how to navigate the waves of Fort Lauderdale. To hone your skills, try one-on-one instruction during a private lesson. Or join a larger group of people for a one or two-hour session. Every lesson includes surfing instruction as well as a hands-on chance to ride the waves. You’ll also learn about ocean awareness and safety to ensure that you can try on your own after the class is over! If you’re looking for a slower approach that still requires quite a bit of strength and balance, try paddleboarding Fort Lauderdale. Sunrise Paddleboards offers lessons and guided tours that will take you to some of the most beautiful locations along the coast. There are a variety of unique experiences for you to select from. Try a full moon paddle, paddle and wine tasting, Whiskey Creek ECO Tour, or even a paddle and snorkel tour. There are so many great possibilities! 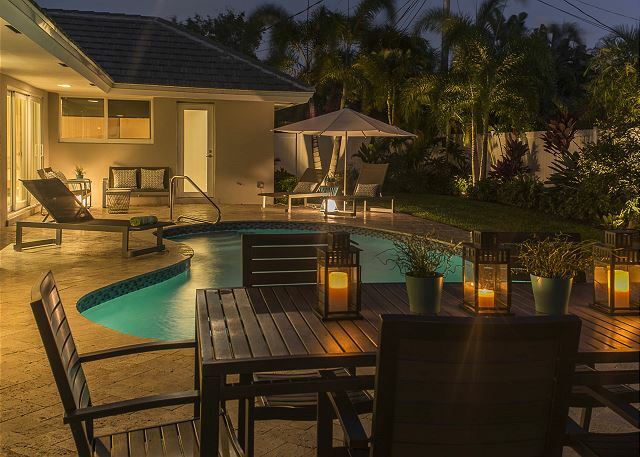 Fort Lauderdale Stays features a variety of homes with a private pool, perfect for your vacation getaway! Enjoy lounging in your private oasis, separate from the crowded tourist pools of local hotels and neighborhoods. After spending your day in the salt water, it will be refreshing to wash off in the fresh water and enjoy dinner or late night drinks on the veranda. Over 14 of our homes have their own private pool. Browse them today to discover your perfect Fort Lauderdale retreat! You’ll Love Shopping at the Sawgrass Mills Outlet Mall — Don’t Miss These Free Things to do in Fort Lauderdale!